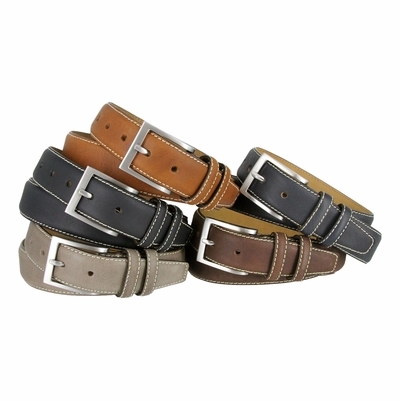 Classic dress belts with natural leather finishes 1-3/8" (35mm) wide in Black, Navy, Grey, Tan, or Brown. Heavy Stitches provide a contrast and further enhance this timeless design. Feathered and heavy stitched edges with a Solid metal Nickle-brushed silver finish buckle also heavy-stitched on with a matching color Double leather loop. Sizing: Measure Around where you wear the belt, with your pants on, and order that size.